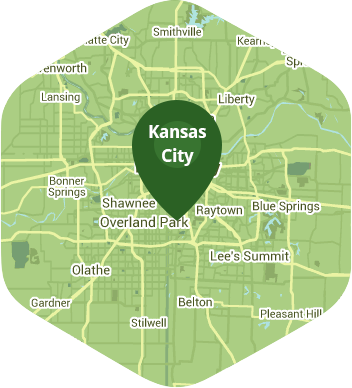 Book a skilled lawn pro in Overland Park. Backed by a total satisfaction guarantee and amazing customer support. There's a reason why Overland Park keeps making the lists of best places to live. Who doesn't want to spend a sunny weekend playing soccer, fishing, taking the family to see farm animals, golfing, biking, or catching a football or baseball game? These are all the things you could be doing...so why are you sweating behind a noisy lawnmower or torturing your back over a rake? We're Lawn Love, and we want you to put away that lawn gear and go have some fun! We combine today's technology with old-fashioned customer service and expertise. So you can easily and conveniently book your lawn care with us, knowing that our independent lawn care experts will carefully tend your lawn, transforming it into a thick, vibrant landscape that's as soothing to the eyes as it is to your family's toes. Want to get your weekends back? Contact Lawn Love today at 816-527-9015 or take advantage of our easy two-minute quote, and see how we can give your lawn the love it deserves. Rated 4.76 / 5 stars in 2,029 Overland Park customer reviews. There won't be any rain in Overland Park today, which means you'll probably have to water your lawn. Dusk and dawn are the best times to water your lawn (the sun will rise at 6:35 AM and set at 8:00 PM today in Overland Park). Here are some average lawn care prices for homes in Overland Park. Average lawn size 6,317 sq. ft.